Andy: Goslings has a nice sweet smell, kind of like cream soda. Mixed with diet coke it has a distince spiciness with a little nutmeg and cinnamon action going on. The taste is a little too bitter for me by itself. Not bad alone, but a great addition to a fruity cocktail. I am really not a fan of dark or black rums by themselves or as the sole alcohol in a mixed drink, although no fruity drink would be the same without it. Adrian: I’ve made many a tropical drink with this as a floater, and it was awesome in every one of those situations. It’s a bit strong to drink straight, slightly more than I can handle. By far a bargain rum for tropical drinks. new to me. Regardless, I’m definitely happy I came across it and I’ll be book-marking it and checking back frequently! I’m a little surprised that you rated Myers and Cruzan higher than Gosling’s. For my money, this is the best dark rum I’ve tried, although I’ve never had the Coruba. 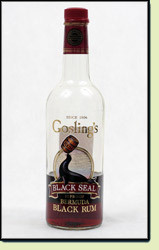 Black Seal and Appleton Estates V/X are my “house rums”. Similar for mixed drinks involving multiple rums. This pulls the oaking process and vanilla to the forefront. If you want to make your own vanilla extract, this is a good rum to pour into smaller bottles with a few vanilla beans and shove a cork down in it. Place corked bottles in the sun over the Summer and in Fall you will have some very good vanilla extract that you can pour into a blender, then strain out the pieces of vanilla bean. Pouring the mixture into splits or even 187ml bottles with a cork you can give these away to friends who bake a lot and don’t have access to the loads of inexpensive vanilla extract found down in Mexico. This is actually better tasting than the bottles made by McCormick or the warehouse style vanilla extracts. Just some food for thought.